In AH 318 Photography, an art history course for 3rd and 4th year students at Pennsylvania College of Art & Design, we have discussed different topics and themes related to photography - development of photography as a fine art, role of women in photography, war photography, use of photography for social change, fashion photography, and so on. We also examined the role of new technologies in how we understand photography in everyday life, specifically drone photography and the smartphone camera. The class looked at how the selfie, despite its lack of mediation between photographer and subject, could be analyzed just as any other product of visual culture. 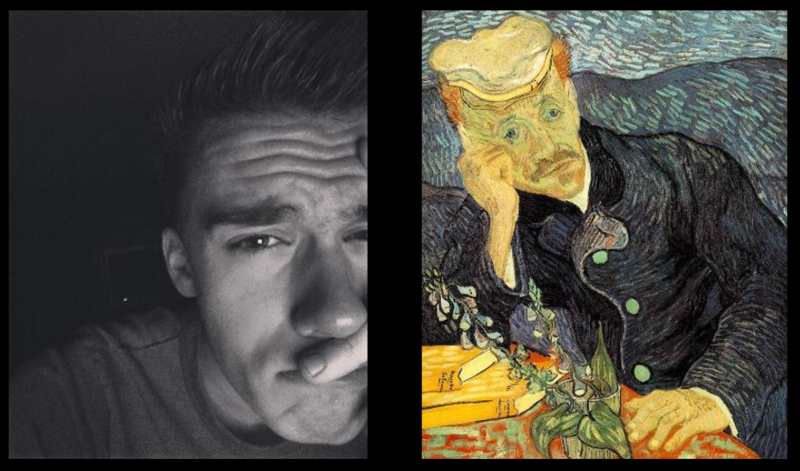 To prove these connections between the selfie and art history, students were asked to take selfies that reflects or relates to works of art. Enjoy! Alumni: While you are here for Senior Show, please take a selfie or two with members of the Class of 2016 and post then on social media with the tag #PCADProud! Kids: The Selfie Class: Exploring Self-Portraits for Grades 1.2.3.4.5. Mon-Fri, July 11-15, 12:30 p.m. - 3:30 p.m. Join us for a week of exploration in this summer class for youth examine the history of a “selfie,” how self-portraits act as art, and what is actually being portrayed from these images. Adults: Photographic Self-Portraits & Selfies PHO 222, Tuesday, July 12 - August 9, 6 p.m. - 9 p.m. Learn a variety of self-portrait techniques from throughout the history of photography. This a great opportunity for amateur and professional photographers to experiment with new techniques, exposure, settings, and lighting.